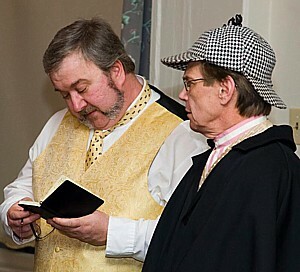 Sir Arthur Conan Doyle's master sleuth, Sherlock Holmes, and his partner, Dr. Watson, join forces to solve a baffling new mystery for 2012 during a weekend of intrigue, Friday through Sunday, March 16-18, in "Sherlock Holmes and the Trial of Moriarty's Challenge," sponsored by the Mid-Atlantic Center for the Arts & Humanities (photo by Joe Evangelista)..
Sir Arthur Conan Doyle’s master sleuth, Sherlock Holmes, and his partner, Dr. Watson, join forces to solve a baffling new mystery for 2012 during a weekend of intrigue, Friday through Sunday, March 16-18, in “Sherlock Holmes and the Trial of Moriarty’s Challenge,” sponsored by the Mid-Atlantic Center for the Arts & Humanities (MAC). Stalk the gaslit streets in search of clues and compete for the $250 grand prize and a variety of other valuable gifts as you attempt to solve the mystery. Full weekend packages are available at $180 per couple or $95 per person and include the welcome reception, performances, tour, luncheon and gift. The Search for Clues tour on Saturday, March 17, can be purchased separately. Affordable overnight packages with accommodations are also available. Call 609-884-5404 or 800-275-4278, ext. 185 for more information or to reserve your overnight package. The Mid-Atlantic Center for the Arts & Humanities (MAC) is a multifaceted not-for-profit organization committed to promoting the preservation, interpretation, and cultural enrichment of the Cape May region for its residents and visitors. MAC membership is open to all. For information about MAC’s year-round schedule of tours, festivals, and special events, call 609-884-5404 or 800-275-4278, or visit MAC’s Web site at http://www.capemaymac.org. LEGOLAND® Discovery Center Chicago is holding a contest to find a Master Model Builder who will be responsible for developing new exhibits and models for the thousands of children and families who attend events at the Center. Interested candidates can apply online at www.legolanddiscoverycenter.com/chicago. Applicants must log on to LEGOLAND Discovery Center Chicago’s website by Friday, Feb. 17 and upload a resume and a one-minute YouTube video showing why they should be LEGOLAND Discovery Center Chicago’s next Master Model Builder. Applicants must be 18 years or older to enter. LEGOLAND Discovery Center Chicago will choose 10 finalists who will be invited to a public build-off event at LDC Chicago in Schaumburg on Sunday, March 4, where their true skills will be put to the test. During the public build-off, candidates will be challenged with mountains of pre-selected LEGO bricks and must build complex LEGO models using only the bricks in front of them. A special panel of adults and children will judge each candidate’s performance to eventually determine a winner. For more information or to apply, visit www.legolanddiscoverycenter.com/chicago. Downtown Salem is celebrating Valentine’s Day weekend with more than 15 large ice sculptures, chocolate samplings and great discounts February 10 – 14, 2012. Beautiful ice sculptures will grace downtown Salem starting February 11 as part of the 10th annual Salem’s So Sweet Chocolate and Ice Sculpture Festival. Ice Sculpture Themes include a dragon, Marilyn Monroe, the SSU Viking, TinTin and Snowy, a crystal snowflake, a one room school house and the Salem Witch. Many downtown businesses will offer discounts and free chocolate during the weekend as well. The festival officially kicks off with a Chocolate and Wine Tasting, on Friday, February 10 from 6:30 – 8:30 pm, at Hamilton Hall, 9 Chestnut Street. This luscious tasting event features wine and chocolate samplings from premier Salem restaurants, stores and sweet shops. The Chocolate and Wine Tasting is sponsored by the Salem Waterfront Hotel & Suites. Tickets are $25 and can be purchased in advance at the Salem Chamber of Commerce starting January 13, 265 Essex Street. The Salem Trolley will be offering trolley rides around the festival route weather permitting on February 11 & 12 from 12 – 4 for Adults $1, children are free. Pick up locations include the Salem Visitor Center, Pickering Wharf and Washington Street near Eastern Bank. With over 60 places to eat, downtown Salem is the perfect place to have a romantic dinner or casual lunch. In celebration of the chocolate weekend, many of Salem’s finest restaurants will feature special chocolate offerings on their menus, including desserts, cocktails, and inventive sauces. Participating Salem retailers will offer in-store promotions, innovative displays and items geared toward chocolate and Valentine’s Day ranging from a chocolate fondue fountain to Valentine inspired dog treats. Once again, Golden Tickets will be available in downtown Salem for a chance to win the Salem’s So Sweet Gift Basket. Pick up your Golden Ticket and have it validated at participating businesses (no purchase necessary) then enter to win a Salem’s So Sweet gift basket which features many fine items from area retailers. There are numerous special events during the festival. The Salem Theatre Company is offering a discount on their hit performance: The Real Thing. The National Park Service Visitor Center will have a historic display on ice and chocolate. Salem Main Streets, the Salem Chamber of Commerce, and local retailers, restaurants and businesses invite you to attend the 10th annual Salem’s So Sweet, Chocolate & Ice Sculpture Festival. A decadent tradition of delectable chocolate, sparkling ice sculptures and Valentine’s Day shopping…don’t miss Salem’s sweetest event of the year! For more information and details about the festival contact (978)744-0004 or visit the website www.salemmainstreets.org or www.salem-chamber.org. 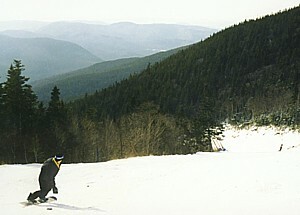 Snowboarding down a trail at Waterville Valley, a premeir New Hampshire ski resort. New Hampshire mountain resorts are offering super deals for Super Bowl weekend © 2012 Karen Rubin/news-photos-features.com. The New England Patriots and New York Giants will face off in Super Bowl XLVI on Sunday, February 5. The Super Bowl is a traditional occasion for family and friends to gather to enjoy the game. The 6:30 pm kickoff time is ideal for skiers and riders who want to enjoy a weekend on the snow and still be on the couch for kickoff with plenty of time to spare. During past Patriots’ Super Bowl appearances many guests have elected to pass up skiing and riding that weekend even though the game isn’t played until Sunday night. As a result, this means less-crowded slopes and an opportunity to enjoy midweek crowds with mid-winter conditions. Ski areas have also recognized the popularity of the Super Bowl and many offer lift ticket specials to entice guests. Among the special offers this Super Bowl weekend is the Super Sunday Special at Cannon Mountain where two people can ski or ride for $68 on February 5. King Pine at Purity Spring Resort will be offering half-day, morning lift tickets for $22 for adults and $15 for juniors on February 5. Attitash Mountain Resort and Wildcat Mountain will be offering $46 all-day lift tickets on February 5. Cranmore Mountain Resort is offering a Super Bowl ECoupon that must be printed in advance from Cranmore.com and is valid for $47 adult, $37 teen, and $32 child lift tickets on February 5. Show up at Gunstock Mountain Resort with your Patriots gear on and receive $12 off a full price adult ticket on February 5. In celebration of Super Bowl XLVI, Waterville Valley will be offering $46 lift tickets for adults and $15 for ages 12 and under on February 5. Ragged Mountain will be offering two-for-one full price lift tickets on February 5. For cross country skiers Jackson Ski Touring will be hosting Super Bowl Widows Weekend with 50% off one or two day trails passes for groups of three or more women. Pine Hill XC Ski Club in New London will be offering a pre-Super Bowl Two Trail Passes for One promotion. Many New Hampshire areas also regularly offer discounted passes on Sunday afternoons, which should prove to be an outstanding time to hit the slopes with many skiers and riders already at home on the couch. Even if you ski right until 4pm you still have 2 ½ hours until kickoff. Among those areas with Sunday afternoon offers are Attitash Mountain Resort, Black Mountain, Bretton Woods, Crotched Mountain, King Pine at Purity Spring Resort, Loon Mountain, Mount Sunapee, Ragged Mountain, Waterville Valley and Wildcat Mountain. Some of these offers apply to specific groups (like NH residents or kids) so please check for full details on the Daily Ticket Deals page at SkiNH.com. “The first year or two the Patriots made the Super Bowl, we noticed some extra space on the slopes. Now that the Patriots make this almost an annual tradition, the ski areas have gotten creative with some incredible deals. Super Bowl weekend provides an ideal opportunity to enjoy mid-winter conditions at a discount price, with fewer skiers on the slopes, and still be home in time for the game,” stated Karl Stone, Ski NH’s Marketing Director. With spring around the corner, WLCVacations is introducing alluring Spring Savings for travelers interested in discovering some of the most beautiful destinations in the world during 2012. For a limited time, couples can save up to $1000 off select cruises, providing exceptional value to consumers. “Whether one is looking for an adrenaline-fueled adventures like trekking through the Amazon, or seeks to unwind under the sun, we have a vacation that suites every interest,” said Ana Valente, president of WLCVacations. In Europe, WLCVacations’ Spring Savings promotion applies to a variety of itineraries including the 7-day Vineyards of the Rhine & Mosel, cruising from the Netherlands to Luxembourg, with stops throughout Europe such as Cologne in Germany and the colorful Keukenhof Gardens in Amsterdam. Guests who book a cabin for the April 1 sailing date by January 31, 2012 will receive $1000 off per stateroom, plus $100 shipboard credit. All-inclusive rates begin at $1,799 per person after discount. As another option, passengers can venture to the exotic Galapagos Islands on a luxury cruise aboard the MV Eclipse, which journeys round trip from Baltra Island. 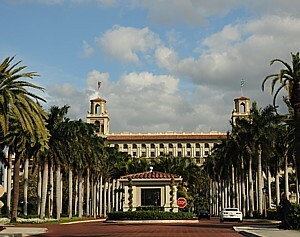 Until February 29, passengers will receive $500 off per person on all January, February and October 2012 cruises. Prices for this 7-day cruise start from $4,650 per person with the promotion included, based on double occupancy. Moreover, Africa’s Egypt takes center stage on the Splendors of Egypt & the Nile. Travelers will sail roundtrip from Cairo, staring at $2,049 with a $300 per person discount. Meanwhile, guests can discover the best of Asia on three itineraries including Highlights of China and the Yangtze for up to $300 off per couple. Beijing and Hong Kong are among the exciting destinations planned from March through November aboard the Victoria Anna and Victoria Jenna. Rates for this 11-day program start at $2,599 per person. 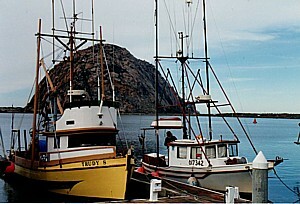 For more information on WLCVacations’ Spring Savings cruises, visit www.WLCVacations.com.